The Baier Quick Acting Watertight hatches have positive latch verification. If the handle is down the hatch is locked. This marine hatch is available with a Built in T-handle turnbar that open and Close with only a quarter turn. This flush deck hatch has the all parts needed for operation contained in the hatch and still remains flush to the deck. 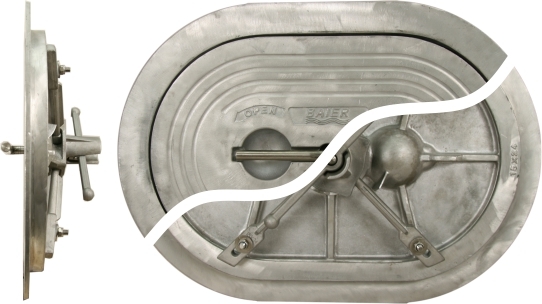 This is our only hatch design that offers positive lock verification that prevents the hatch from being left unlocked. They are standard equipment on fish boats, tugs, barges, work boats, and other marine vessels and many US Navy and US Coast Guard vessels. These hatches also feature a new 4 dog latching system of securing the hatch cover to the deck. The 4 dog system is a proven mechanism for hatch engagement. Baier hatches are the strongest, most reliable, and easily serviceable watertight hatch in the industry. Cast aluminum – Lightweight, Strong and corrosion resistant. Stainless Steel – For special applications. Each hatch has an underside escape turning bar for safety. An optional turning wheel is also available. Never lose the wrench again with the built in T-handle turnbar.